Afzelia africana is widespread, occurring from Senegal east to Uganda, and south to DR Congo. Like other Afzelia spp., the wood of Afzelia africana is characterized by an excellent stability with little susceptibility to variations in humidity, small shrinkage rates during drying and a good natural durability. The wood is durable and treatment with preservatives is unnecessary, even for usage in permanent humid conditions or in localities where wood-attacking insects are abundant. This makes it an excellent wood for use in pleasure-crafts, especially for keels, stems and panels, for bridges, as well as interior fittings. For such uses it is sometimes as much in demand as teak. The wood is also valued for joinery and panelling, both interior and exterior, parquet floors, doors, frames, stairs, furniture and sporting goods. It has been used traditionally for canoes. It is commonly used for domestic articles such as boxes, bowls, spoons, mortars and masks, and is locally popular for making drums. It is suitable for decorative sliced veneer. Because of its good resistance to many chemical products and great dimensional stability, it is often preferred to materials like metals and synthetics for vats and precision equipment in industrial applications. The neutral pH of the wood makes it suitable for applications in contact with vulnerable objects such as antiques and old books in libraries. However, it should not be used in contact with textiles under more humid conditions because of the presence of colorants. A red dye can be prepared from the heartwood. The wood is also used as firewood and for charcoal production. The foliage is commonly used as forage and the tree is particularly important as a source of fodder for livestock in the dry season. In many regions, Afzelia africana is one of the most important woody fodder plants. The leaves are sometimes eaten cooked as a vegetable; young leaves are mixed with grounded cereals before cooking. The flowers are used as condiment in sauces. The tree is valued in agroforestry systems for soil improvement because the leaves are rich in nitrogen and minerals. The seed aril is edible and reportedly sweet; precaution is needed because the seed has been reported to be toxic, although it is used as soup condiment in Nigeria and is rich in oil and used as thickening agent. The fruits have been used as castanets, seeds for necklaces and for other ornamental and ritual purposes. Afzelia africana is considered a fetish tree in many regions. Roots, bark, leaves and fruits are used in traditional medicine. Root decoctions or macerations are used to treat stomach complaints, convulsions, trypanosomiasis and hernia, and as antidote. Root powder is applied externally to treat rheumatism. The roots have also been used in mixtures to prepare arrow poison. Bark decoctions and macerations are administered in the treatment of constipation, fever, vomiting, oedema, tachycardia, hypertension, bronchitis, lung complaints and bleedings during pregnancy, and as anodyne, diuretic, galactagogue and aphrodisiac. 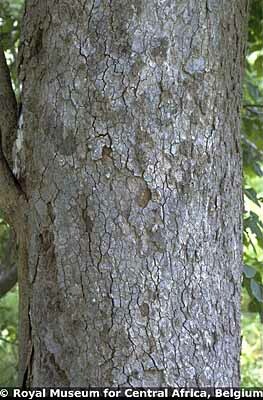 Bark ash is applied externally to treat lumbago and bark powder to wounds and swellings. The bark is also used as fish poison. Leaf decoctions and macerations are taken or applied externally against dysmenorrhoea, epilepsy, oedema, migraine, stomach-ache, asthenia, trypanosomiasis and as anodyne. Fruit preparations are taken to treat lung complaints and as aphrodisiac. Fruit ash is applied against leprosy, and as soap substitute. Twigs are used as chewing sticks. Afzelia africana is not the most important Afzelia species for the international timber market. Its wood is often mixed with that of more commonly traded species such as Afzelia bipindensis Harms and Afzelia pachyloba Harms, and traded as ‘doussié’, for which Cameroon is the main exporting country. In 2003 Cameroon exported 9900 m³ of sawn doussié wood and 47,750 m³ in 2005. Exports from Côte d’Ivoire declined strongly in 2007 and 2008 because of dwindling stands and the economic crisis in importing countries. In 2005 Ghana exported 9000 m³ of sawn Afzelia wood (as ‘papao’), and 7000 m³ in 2006 at an average price of US$ 780 per m³. The heartwood is orange-brown to golden brown, becoming red-brown upon prolonged exposure, sometimes with darker streaks. It is distinctly demarcated from the whitish to pale yellow, up to 8 cm wide sapwood. The grain is usually straight, occasionally interlocked, texture medium to coarse but even. The wood is slightly glossy and dried wood has a leather-like smell upon planing. The wood is medium-weight to moderately heavy, with a density of 720–850 kg/m³ at 12% moisture content. Drying usually does not cause problems, without deformation and splitting, but the wood dries rather slowly. For thick boards (more than 7.5 cm), preliminary air drying under cover is recommended before kiln drying. The shrinkage rates are low, from green to oven dry 2.5–3.5% radial and 3.5–5.0% tangential. Once dry, the wood is very stable in service. At 12% moisture content, the modulus of rupture is 105–145(–200) N/mm², modulus of elasticity (9100–)14,000–17,000 N/mm², compression parallel to grain 57–85 N/mm², shear (5–)7.5–10(–14) N/mm², cleavage 16–25 N/mm, Janka side hardness 7200–8000 N and Chalais-Meudon side hardness 5.7–8.2. The wood saws easily when good equipment is used; it contains little silica (less than 0.015%) and stellite-tipped saw teeth are not needed for sawing fresh wood. Some logs have gum pockets, which may cause problems in sawing by blunting saw teeth. Tungsten-carbide-tipped cutting tools are recommended in planing and moulding operations. It is recommended to reduce the cutting angle to 15° to avoid rough surfaces when interlocked grain is present. The use of a filler is recommended to obtain smooth surfaces. The nailing and screwing properties are satisfactory, but pre-boring is recommended to avoid splitting. Gluing usually does not cause problems. The wood paints and varnishes well, but wood zones close to the centre of the log may contain anti-oxidant substances that slow down drying of varnish and may cause problems in painting. Sliced veneer of good quality can be produced, but the wood is not suitable for peeling. The wood has a good reputation for its resistance to acids and alkalines. Investigations of the fibre and vessel characteristics indicate that the wood is not suitable for the production of good-quality pulp and paper. Logs may have crevices filled with a whitish powdery substance originating from the wood vessels; the substance consists of kaempferol and derivatives. Kaempferol and its glycosides have antibacterial, antifungal and anti-inflammatory activities. Several other flavonoids have been isolated from the wood. The wood contains 39–44% cellulose and 28–31% lignin. The solubility is 14–17% in a 1% NaOH solution. The foliage has an excellent digestibility, in vitro about 51% of the dry matter and in vivo in sheep 64% of the dry matter, and is rich in proteins. The energy value is 8120 kJ/kg (1940 kcal/kg), and leaves contain on a dry matter basis about 17.2% protein, 8.4% lipid and 8.6% ash. The crude protein content of the foliage decreases significantly from the late dry season to the cool season. Tests with goats did not show adverse effects. The seeds contain about 27% protein, 33% carbohydrate and 32% lipid. They contain 18–37% of oil. The oil is semi-drying, needs little purification and has a long shelf-life. It is suitable for the formulation of alkyd resin and shoe polish. Linoleic acid is the predominant fatty acid. Toxicological studies of the oil showed no detectable toxins. The presence of a cyanogenic compound may explain the reputed toxicity of the seeds. Experiments showed that flour with potential for use in pastries can be made from the seeds. Supplementing wheat flour with up to 30% seed flour of Afzelia africana improved the protein quality. Experiments with chickens showed that seeds could be fed as a good source of protein, but it was recommended to roast the seeds before feeding because they may contain phytates and alkaloids. In a study with type II diabetic patients in Nigeria, it was shown that the incorporation of Afzelia africana seeds in the diet had hypolipidemic effects. The twigs contain high concentrations of tannin, which explains their traditional use as chewing stick. The wood of three other Afzelia species is similar to that of Afzelia africana and also traded as ‘doussié’: Afzelia bella Harms, mainly exported from West Africa, and Afzelia bipindensis Harms and Afzelia pachyloba Harms, mainly exported from Central Africa. The excellent properties of Afzelia africana wood concerning dimensional stability and high natural durability are comparable to some well-known timbers such as merbau (Intsia spp.) and teak (Tectona grandis L.f.), and to the African makore (Tieghemella heckelii (A.Chev.) Roberty) and douka (Tieghemella africana Pierre). Evergreen, small to fairly large tree up to 40 m tall; bole branchless for up to 20 m, usually straight and cylindrical, up to 150(–200) cm in diameter, often with unequal, thick buttresses up to 1.5 m high; bark surface greyish to reddish brown, scaly with roundish scales, inner bark pale brown to pinkish brown, with yellowish brown exudate, very aromatic; crown elongate to rounded or flattened depending on age and growing conditions, with tortuous, more or less upright branches; twigs glabrous. Leaves alternate, paripinnately compound with 2–5(–6) pairs of leaflets; stipules with basal parts fused and persistent, upper parts free, linear and caducous; petiole and rachis together 4–32 cm long, grooved; petiolules 0.5–1(–1.5) cm long, often slightly twisted; leaflets opposite, elliptical to ovate-elliptical, 5–15 cm × 3–8.5 cm, obtuse to acute or short-acuminate at apex, glabrous, pinnately veined with 6–9 pairs of lateral veins. Inflorescence a terminal or axillary panicle up to 20 cm long, brown short-hairy. Flowers bisexual, zygomorphic, sweet-scented; pedicel 1–1.5 cm long, jointed at base; bracteoles c. 0.5 cm × 0.5 cm, caducous; hypanthium c. 0.5 cm long; sepals 4, 0.5–1 cm long, unequal, densely short-hairy; petals 5, one c. 1.5 cm × 1 cm, with long claw, 2-lobed, greenish white with red-purple marking in the centre, 4 others minute; fertile stamens 7 and 1.5–2 cm long, rudimentary stamens 2 and c. 0.5 cm long; ovary superior, c. 4 mm long, with stipe c. 2 mm long, short-hairy, style c. 2 cm long, curved. 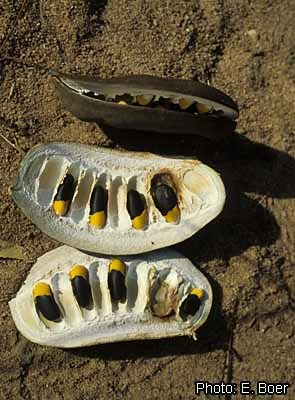 Fruit an oblong, flattened pod 10–20 cm × 5–8 cm, dark brown to black, dehiscing with 2 woody valves, c. 10-seeded. Seeds ellipsoid or oblong-ellipsoid, 1.5–3 cm long, black, with cup-shaped, orange aril at base. Seedling with epigeal germination; hypocotyl 7–16 cm long, epicotyl 8–20 cm long, glabrous; cotyledons fleshy, oblong, c. 2 cm long, erect; first 2 leaves opposite, with 2–3 pairs of leaflets. Rays: 97: ray width 1–3 cells; 104: all ray cells procumbent; 115: 4–12 rays per mm; 116: ≥ 12 rays per mm. Seedlings are very sensitive to fire, browsing and drought. In Côte d’Ivoire it has been reported that young trees of Afzelia africana often develop poorly because of damage caused by animals such as antelopes or livestock that feed on the foliage and damage terminal buds. Low branching is often the result. For proper development, trees have to grow fast enough in the rainy season to have their terminal buds out of reach of the browsing animals in the dry season. Once this critical period has passed, young trees may grow up to 1 m per year in height. Based on studies of growth rings, the mean annual diameter growth of the bole is up to 1 cm on termite mounds and localities with rich soils in savanna regions. In open forest in northern Côte d’Ivoire, mean annual diameter growth has been estimated at 11 mm up to an age of 40 years, and in dense forest at 6–8 mm up to 50 years old. In experimental plantations in Côte d’Ivoire, trees showed a survival rate of 96% with an average bole diameter of 15 cm 10 years after planting in evergreen forest, a survival rate of 100% with an average tree height of 11 m and bole diameter of 11.5 cm in transition forest, and a survival rate of 82% with an average tree height of 8 m and bole diameter of 12 cm in semi-deciduous forest. In 17-year-old plantations, trees attained an average height of 16 m and a mean annual diameter growth of 0.7 cm in semi-deciduous forest, and an average height of 19 m and a straight and cylindrical bole of 10 m long in evergreen forest. 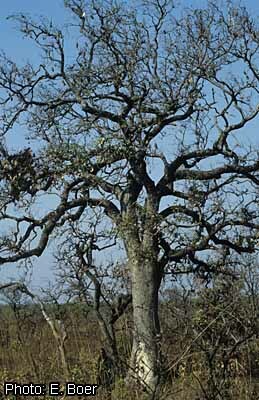 In savanna areas the bole of trees is usually short, rarely reaching 12 m, but in the forest it may reach large dimensions. Trees usually flower in the rainy season. The flowers are sometimes eaten by bats. Fruits take about 6 months to ripen after flowering. They may remain on the tree for another 6 months. The seeds are dispersed by birds such as hornbills, which feed on the arils. The roots are associated with ectomycorrhizal fungi; more than 30 species of fungi have been recorded. Afzelia africana is characteristic for the transition zone between wooded savanna and dense dry forest, and for dense semi-deciduous forest in more humid regions. It has been considered a principal component of the semi-dry forest that once covered large parts of the region from southern Senegal to Guinea. Afzelia africana shows a wide adaptation to climatological conditions, but is most common in areas with an annual rainfall of more than 900 mm. In drier regions it is limited to localities with deep, well-drained but moist soils and to termite mounds. It occurs up to 1400 m altitude. Afzelia africana is found on a wide variety of soil types, often on hardpans of calcareous, sandy or ferralitic soils, on steep slopes, as well as in depressions and in regularly inundated sites. In the driest sites, Afzelia africana has a reputation of being fairly fire resistant, but in dense forest it appears to be susceptible even to occasional fires. Afzelia africana woodland decreases and is being invaded by more fire-tolerant species when it is commonly burned. On sandy-loamy soils in Burkina Faso, seedlings are often found abundantly beneath parent trees, with 10–100 seedlings per 100 m². However, they rarely develop into larger saplings. In general, Afzelia africana regenerates poorly. This is often a result of regular burning of the vegetation and high predation of seedlings by animals. The seedlings are also susceptible to drought. In Côte d’Ivoire it has been demonstrated that regeneration can be abundant when sites are protected against fire. There are 200–500(–800) seeds per kg. In southern Mali seeds can be collected from mid-November to mid-January and in northern Côte d’Ivoire in October–November. 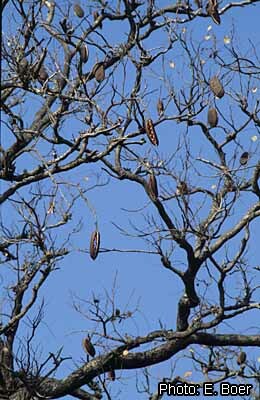 Pods are collected from the tree when they turn from green to brownish. They are dried in the shade in a well-ventilated locality and open spontaneously after some days. For storage of the seeds, arils should be removed, but it has also been reported that this should not be done because they may have a role in the maintenance of a good germination rate. Seeds are dried for 2–3 weeks in the shade and then stored in jute bags in a well ventilated room. Seeds with arils stored in this way had a germination rate of 95% after 14 months. Seeds with a water content of about 8% can be stored for at least 3 years in air-tied containers at room temperature, without significant reduction of the germination rate. It is advised to add ash to the containers to reduce insect damage. In Benin it is recommended to sow only seeds with a weight of more than 2 g, resulting in more vigorous seedlings. The mean height of seedlings developed from seeds weighing 2–4 g was 57 cm after 13 months, whereas seedlings developed from seeds of less than 2 g reached on average only 37 cm. To obtain a rapid and homogenous germination, pre-treatment of the seeds is needed. In Mali and Burkina Faso, seeds are soaked in water for 1–2 days with or without scarification, and in Côte d’Ivoire they are treated with concentrated sulphuric acid for 30 minutes, followed by soaking in water for 3 hours, or they are soaked in water for 3 days. Germination rates of 100% can be reached after such treatments. The optimum temperature for germination is 25–30°C. The depth of sowing is important for germination. Seeds buried for 2 cm with the hilum facing downward showed the best results, whereas seeds buried for 6 cm germinated but decayed. Sowing is usually done in pots. The taproot grows rapidly and may reach the bottom of the pot in 3–4 weeks. In nursery tests, inoculation with ectomycorrhizae did not result in increased growth; possibly endomycorrhizae play a role in early tree growth. Seedlings can be transplanted into the field after 3–4 months. A test in Senegal showed good results for planting seedlings of more than 180 cm tall raised for 3 years in the nursery, with a survival rate of 60–100% after one year when leaves and roots were retained as much as possible. In tests in Guinea, bare rooted plants of 6 and 15 months old showed a survival rate in the field of 75% and 95%, respectively, after the first rainy season. Propagation by grafting is possible. No special soil preparation is needed before planting. For seedlings raised in the nursery, holes of 40 cm in diameter and 40 cm deep are usually made. After planting, seedlings should be protected against browsing animals for 2–3 years, as well as against fire. Regular weeding is needed in young plantations. In plantations in southern Côte d’Ivoire the number of stems had been reduced by 2 thinnings to 360–410 stems/ha 12 years after planting, resulting in a mean annual diameter growth of 1.5 cm over a period of 17 years. Enrichment planting has been practised in transition and deciduous forest, with spacing of about 15 m between lines and 2–3 m between plants in the line. In savanna regions Afzelia africana has been planted in mixtures with Gmelina arborea Roxb. ex Sm. and Harungana madagascariensis Lam. ex Poir., which may serve as nurse trees. Afzelia africana usually occurs scattered, rarely in small groups. In wooded savanna in northern Côte d’Ivoire, the density of trees with a bole diameter of more than 10 cm varies between 0.1 to 1.5 trees/ha, but in more humid forest densities up to 40 trees/ha can be found. Trees can be coppiced and pollarded. Seedlings are susceptible to fungal and grasshopper attacks and should be protected against browsing by numerous mammals. In dense forest in Côte d’Ivoire, a bole branchless for 12 m and with a diameter of 70 cm yielded 4.5 m³ of wood, and one of the same length but with a diameter of 100 cm 9.3 m³. In open forest and savanna, boles with a diameter of 70–100 cm are usually not longer than 4 m and yield 1.2–2.3 m³ of wood. Prolonged stocking of logs after harvesting does not cause problems except occasional black holes in the sapwood caused by borer attacks. Logs of Afzelia africana are too heavy to be transported by river. Afzelia africana does not seem to be in immediate danger because it occurs widespread in a wide range of habitats. However, in many countries where high pressure exists on Afzelia africana for fodder, it is becoming threatened, e.g. in Mali, Burkina Faso, Benin, Nigeria and Cameroon. Exploitation for timber is locally severe, e.g. in Ghana, and conservation measures have been recommended. Afzelia africana is included in the IUCN Red List of threatened species as vulnerable because of intensive exploitation. Afzelia africana has good prospects as a commercial plantation timber, although it does not grow rapidly and needs rather rigorous management. The high value of its wood and its ability to grow in mono-specific stands make it economically interesting. It deserves more research, especially on its genetic diversity and breeding for superior characteristics. As a true multipurpose tree, it is of great interest for use in agroforestry systems. The seeds may be a useful nutrient source for humans and animals, but further toxicological studies are needed. The nutritive value of the foliage seems to justify the high preference as a source of forage in agrosilvopastoral systems. However, methods of sustainable management should be investigated. Although various plant parts of Afzelia africana are widely used in traditional medicine, few studies on phytochemistry and pharmacological activities have been done. The available research results show interesting leads for the development of new drugs, and additional research is strongly recommended. Gérard, J. & Louppe, D., 2011. Afzelia africana Sm. ex Pers. In: Lemmens, R.H.M.J., Louppe, D. & Oteng-Amoako, A.A. (Editors). PROTA (Plant Resources of Tropical Africa / Ressources végétales de l’Afrique tropicale), Wageningen, Netherlands. Accessed 11 April 2019. This page was last modified on 23 March 2017, at 16:17.